Although they’ve dropped in price a great deal since their launch, modern consoles are still expensive - and that’s before you even think about adding any optional extras. 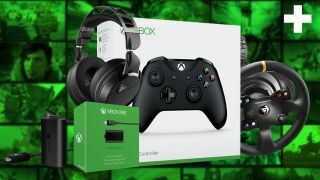 Because many Xbox One accessories are kinda essential, we’ve tried to find the best possible deals on them here (after all, everyone loves to save a bit of cash). Our team have also hunted down savings on controllers. These usually go for around $59.99 a pop, so any reduction is much appreciated. Get the classic black controller for less. Of all the Xbox One accessories you can get your hands on, we’d recommend prioritising the Play and Charge Kit. This gives your wireless controller a rechargeable battery pack that’ll be much better value for money than AAs in the long run. Similarly, a good headset can make a world of difference as well. Besides providing a more immersive experience, those with surround sound help you gain the upper hand in multiplayer because you know exactly where your foe is coming from. Cool, right? If you fancy giving yourself another competitive edge, we’ve included deals on pro controllers too. No matter whether you need it for co-op or as a replacement to your old handset, getting a spare Xbox One controller is always a good idea. We’ve listed some of the best deals and colors below. Of all the accessories you can get for Xbox One, a Play and Charge Kit is probably the most essential. This gives your wireless controller a rechargeable battery pack, and that’s so much more cost-effective than shelling out on AAs. Dedicated gaming headsets can completely transform your experience; not only are they more immersive, they also give a tactical advantage through the magic of surround sound. We’ve listed our favorite kinds below. This headset has been at the top of our best headsets list for quite some time, and the reason is simple; it’s truly excellent. Balancing affordability with fab audio quality and punchy bass, you can’t do much better than this at the same price-point. Want something a little more affordable? Go for the Corsair HS50. As well as being from a reliable manufacturer, these cans have a detachable mic that allows you to use it outside of gaming. That’s pretty handy. While there may be a good amount of memory on an Xbox One, it’ll run out sooner than you think. This is why an external hard drive is a must. Our pick here - WD’s 4TB My Passport Portable - will sort all of your storage problems. Want to get more out of your competitive gaming experience? You want a pro controller. These add extra inputs and adjustable buttons to reduce finger travel time. These also allow you to respond to threats instantaneously. If you want precision and exceptionally high build quality, you want the Xbox One Elite controller. With programmable buttons, back paddles, and thumbsticks that can be swapped for performance-targeted alternatives, this is one hell of a tricked-out handset. Razer’s alternative to the Elite Controller is just as good as you’d expect from the veteran manufacturer. This particular model offers the usual mix of back paddles, programmable buttons, and interchangeable elements, but it’s got fancy chroma lighting as well. Snazzy. Just as headsets can transform the game into something much more absorbing, steering wheels are able to completely change how a racer handles. With force feedback and tactile resistance from tearing around corners, this is one accessory you can’t afford to miss if you’re a fan of driving sims. We'd recommend the Thrustmaster TX; it offers amazing force feedback, a quality feel, and more reasonable pricing than many other wheels. Fancy playing on your PC with an Xbox One controller? If you’ve got an older model, you’ll need the Xbox One Wireless Adaptor for Windows 10. This allows it to sync with your computer. However, those with a newer Xbox One handset should be able to connect via Bluetooth or a standard micro USB cable. Unsure whether you have a new or old controller? The handset on the left of this picture is an original model, while the one on the right is newer (and therefore able to use Bluetooth on your PC out of the box).